Great news, folks! Fun-loving hipsters planned a plethora of snowball fights Saturday, and if went as planned, these didn't have guns at them! People converged at noon Saturday in front of the Reeves Center (14th and U) for Snowpocalypse '10. That was the scene of the original event that caused all the problems. 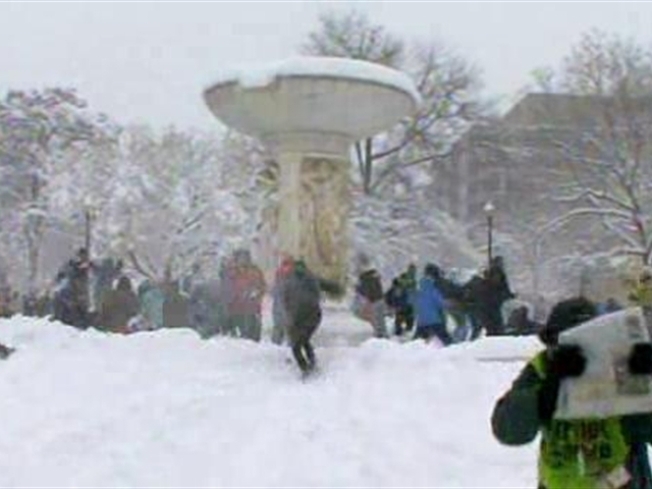 The Official Dupont Circle Snowball Fight had the hype -- its Facebook numbers hovered at about 3,000 fans at one point. The brouhaha started at 2 p.m., and it looked like a good time was had by most. There were some reports of minor injuries and some unhappy motorists whose vehicles became part of the festivities, however. We Love D.C. reported on at least two battles planned: the Friendly "No Guns This Time, MPDC"! Public Snowball Fight on the Ellipse (noon to 3 p.m.) -- and one by the Smithsonian Metro station (bravely scheduled for 3 p.m. to midnight), appropriately titled Snowpocalypse II: Snowball Fight and Snow Kickball. We're not sure how the kickball folks will be able to keep track of the ball in the 17,000 feet of snow we're getting. But hey, we admire them for trying. The Snowpocalypse Celebration was to get a group together at Fort Dupont Park/Randle Circle in Ward 7. That one was scheduled for noon to 2 p.m.
CarbonfreeDC kicked one off at 1 p.m. in the vicinity of 236 R St. N.W. -- more precisely, at the field one block south. The Columbia Heights Snowball Fight kicked off at 2 p.m. at Malcolm X/Meridian Hill Park (16th and Euclid streets N.W.). The Snowgasm Snowball Fight was to be held at the University of Maryland College Park's McKeldin Mall between 1-3 p.m. Saturday. Juniors and seniors wore red and defended the south campus side of the mall. Freshmen and sophomores wore black and defended the north campus side. Annnnd there was another one planned for 3 p.m.at the National Mall (4th Street N.W. & Madison Drive).